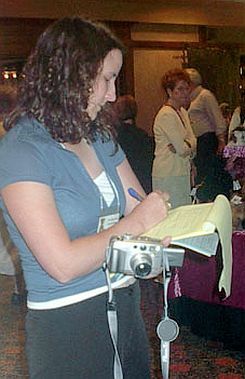 Trina Laube, editor in chief of Teddy Bear Review Magazine was in attendance at Bright Star Promotions' summer Ann Arbor Teddy Bear Show. 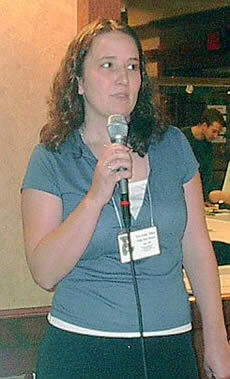 She introduced Teddy Bear Review magazine to collectors, wrote an editorial, and circulated amongst the artists interviewing. 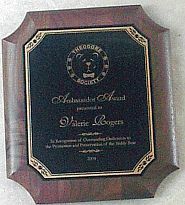 Asking Valerie Rogers, the show's sponsor, for time on the microphone to announce the Theodore Society activities, Trina began. 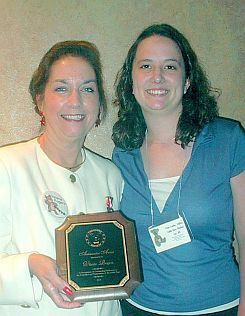 Trina's speech contained glowing accolades about a special person involved with teddy bears for over 20 years; everyone listened intently, and what to Valerie's surprise, Trina presented the time honored Theodore Ambassador award to her. "I'm speechless!" began Valerie. "What an honor to receive this prestigious award, handsome plaque, certificate and distinctive lapel pin. I will display and wear the pin with great honor." Later that year Valerie attended the Teddy Bear Expo in Washington, DC where she met Jim Jones, Publisher of Teddy Bear Review and again to cherish the honor. The Ambassador Award recognizes a person for work and accomplishments on behalf of the teddy bear. 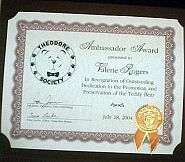 The Theodore Society is an organization dedicated to the promotion and preservation of the teddy bear. 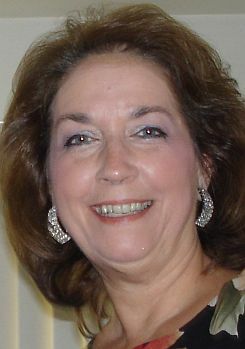 Valerie established and incorporated Bright Star Promotions in October 1982 and created a successful show environment for artists to exhibit, sell their bears and be introduced to collectors. Her Southern hospitality, mixed with an eagerness to see each artist achieve success, she's kept the shows fresh and they have remained strong and active. In 2001 Bright Star Promotions celebrated the 500th show they have produced. "A few more years and we'll have nearly 600 shows under our belt," she smiled. "Teddy bears are in my blood!" What is the Theodore Society? The Theodore Society brings together, in a worldwide 'hug,' retailers, fabric suppliers, teddy bear club members, collectors, artists, manufactures and industry notables working in concert to carry on the love and goodwill naturally generated by a close association to the teddy bear. See all the winners todate. Jones Publishing Inc, was founded in 1986. Today, the company boasts six leading craft and collector publications—DOLLS, Teddy Bear Review, Doll Crafter & Costuming, Fired Arts, Fired Crafts and The Crafts Report. The company sponsors annual competitions to promote and honor the best of collectibles in their respective industries including the DOLLS Awards of Excellence and Golden Teddy Awards including the annual Theodore Society Ambassador Award. Copyright © 1997 - 2008 Bright Star Promotions, Inc. All rights reserved.